Please Note: We are in the process of changing out our meters. Detailed information about the meter change out process is located under the Current Projects tab under News & Notices at the top of the page. Your meter has an LCD display that solar powered or light activated. When you open the meter box, the LCD display will light up from solar power. At night, you will need to use a flashlight to read the meter. The display will show 7 digits followed by a decimal and 2 more digits. 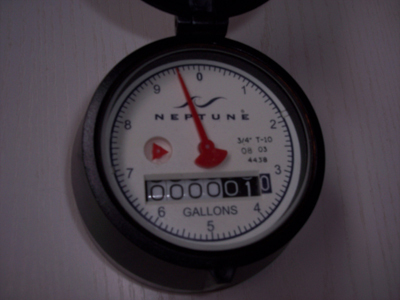 WCWC will only use the 7 digits before the decimal for your billing, but the tenths and hundredths of gallons can be used in determining how much water a leak is using. The meter divides each day into 96 fifteen-minute intervals. If all 96 intervals showed usage, this constitutes a continuous leak. If 50 to 95 of the intervals showed usage, this is considered an intermittent leak. Typically 15-20% of a water utility’s customer base has undetected leaks. This is a bi-directional arrow that appears on the LCD and shows the direction of flow through the meter. No arrow – Water is not in use. Arrow with (+) – Indicates forward flow This is a faucet symbol that appears on the LCD display alerting that there maybe a leak. This displays the average flow rate. Every six seconds the word “Rate” will flash and the flow rate will be displayed for 2 seconds. Faucet on continuously – Indicates water use for all 96 15-minute intervals in a 24 hour period.